Araatris: “Get out. Get out!” Sarah hurries through the doorway and ducks just in time to avoid a flying hair brush that clatters against the wall. Rhoelyn: Nysse stares at the ragged looking guard worriedly. Sarah gasps and grabs her arm. “You have to do something!” She looks over her shoulder nervously. Araatris: Clutching the mask closer to her chest, Nysse frowns. “What’s going on?” she whispers. “She’s nearly uncontrollable, today,” the guard responds. Rhoelyn: The huntress carefully knocks on the now closed door. “Rhoelyn? It’s Nysse. Can I come in, sister?” Nysse bites her lip, waiting for an answer. Araatris: Sarah grimaces in the silence and points at Nysse’s boots. “Whatever you do, make sure they’re clean before you go i-” The door cracks open. Araatris: “I missed you, too.Thank Elune that you’re safe. Davin and the guards are driving me quite mad,” she sighs, resting her head on Nysse’s shoulder. Rhoelyn: Nysse smiles. “Thank you.” Rhoelyn takes a deep breath and raises the mask. The huntress holds her own breath, reaching down to grasp her dagger. Araatris: Rhoe presses the mask over her face, closing her eyes. She holds it there, her hand increasingly shaky until… she yanks it away, gagging. 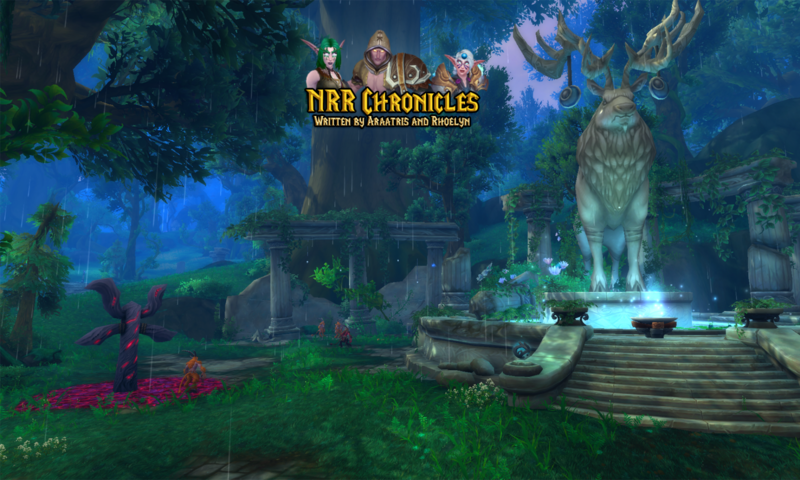 Rhoelyn: The young night elf droops, but she asks hopefully, “Do you feel any different excluding the smell?” Rhoelyn shakes her head, looking green. Araatris: “A-am I meant to vomit up this illness?” She shudders, taking a series of deep breaths and moving over to sit on the edge of the bed. Araatris: Looking disappointed, Rhoe complains, “Must you go already? You just got here.” Nysse sighs and steps over, taking her hands. Rhoelyn: The young night flinches. “I’d rather stay, but that won’t cure your illness, Rhoe. I promise I’ll be back soon.” She sets down the hairbrush. Araatris: When her sister just pushes to her feet and walks over to her window seat without a word, Nysse sighs and slips out into the hallway. Rhoelyn: She strides down towards Leothir’s door and cautiously peers inside looking for Quaed and Nataro. The blood elf reclines lazily on his bed. Rhoelyn: She bites her lip. “Here. Why don’t you try this? It might be able to cure you and Rhoe.” Nysse steps close enough to hold out the mask. Araatris: Leothir gives her a droll look. “You could have warned me, you know.” Nysse shrugs, and he smirks. “A small revenge?” She clears her throat. Araatris: Nysse frowns uncomfortably and mutters, “Rhese’s lady…” Still on his best behavior, the mage just grins and puts the mask to his face. Araatris: Eyes going wide, Nysse fumbles and grabs the dagger off her belt, stepping toward him. “Leothir?” She readies herself to face the sha fiend. Araatris: The mage groans and arcs his back, suddenly gasping. “It’s… It’s…” He chokes. “C-can’t… breathe. Nysse! Help me!” She frowns at him. Rhoelyn: “What are you talking about?” She narrows her eyes. “You’re breathing right n-” Nysse gasps as he reaches up and tugs her down to him. Araatris: “Why, didn’t you realize that your beauty takes my breath away?” He says with a wicked grin, wrapping his arms around her tightly. Rhoelyn: She squirms, her face flushed. “L-let go! You said that you were on your best behavior!” Nysse shoves her hand with the dagger between them. Araatris: “As it turns out,” he says silkily, “My best behavior isn’t as good as I thought it was.” The huntress scowls, pushing against his chest. Araatris: That actually earns a frown for a fleeting moment before the predatory grin comes back. “We could change that, you and I.” Nysse pales. Rhoelyn: Leothir stares at her, agape. “You… you cut me!” Nysse shoves away, breaking his grip and rolling to the side. She grabs the mask and scrambles. Araatris: “I w-warned you that I would!” Clutching the mask to her, she clambors to her feet while he presses a hand to the wound, his expression darkening. Rhoelyn: He snarls, “That’s no way to treat your future-.” Nysse’s eyes widen as Leothir lunges forward. The huntress throws herself toward the door. Araatris: The sin’dorei snags her upper arm, and she immediately swings the dagger around, slicing him across the shoulder. He curses, his grip loosening. Araatris: Staggering back, Leothir crashes into a table before he catches himself. He snarls as he holds his hands out to draw mana, but his cuffs stop him. Araatris: As the rogue chuckles, his compatriot growls out, “You wound me! Quite literally.” Nysse walks faster, her feet carrying her to the stable. Rhoelyn: Nysse practically runs through the stable. When she finds the wolf, she sags to the ground and hugs her. Then she buries her face in Tsume’s fur. Araatris: The wolf licks at her mistress’ arm, flopping her warm tail across her as Nysse trembles with reaction, her sobs muffled and quiet. Araatris: “What am I supposed to do, now?” The huntress wipes at her tears, straightening to look into Tsume’s dark eyes. The wolf nuzzles her cheek. Araatris: The pale wolf licks at her before shifting, a nudge to her mistress to get moving. Nysse nods and gives her one last squeeze before she stands. Rhoelyn: The huntress bolts out of the stable, barely dodging a pandaren caretaker. “Sorry!” She ducks into the main building again and jogs down the hall. Araatris: The night elf steps into the room, barely remembering to sketch out a quick, respectful bow to the Spirit-Sage before she answers. Rhoelyn: “This makes sad people happy instead of angry people calm. I believe we need to find the calmest place in Pandaria and start there,” she rambles. Araatris: He lifts a spare cup and gestures to the tea pot. “Might I offer you tea? He may be a few minutes.” Nysse shifts impatiently, but nods. Araatris: Allowing herself a weary sigh, Nysse manages a little smile. “It’s been a long day, elder.” He bustles her toward the chair and passes her tea. Araatris: Nysse blushes and hides her shy grin by blowing on her tea. She’s saved from responding by Tai’s silent return. He hands Gaoquan a bundle. Rhoelyn: Nysse peers curiously as she takes a cautious sip of her tea. “That’s the tile? Does it have something written on it?” He unwraps it carefully. Rhoelyn: The huntress leans forward and takes it with her free hand. Turning it towards her, she scans the plate. The Spirit-Sage drinks his tea. Araatris: On the surface of the old ceramic is a faded and worn painting showing a white tiger fallen before a large Mogu, grey sha-fiends around them. Rhoelyn: “Yet, somehow he managed to overcome it,” she murmurs. “I really hope he can help.” She sets the tile on her lap and drinks her cooling tea. Rhoelyn: “If even he’s forgotten it how do we know it exists or even how to find it?” The huntress puzzles aloud and finishes her tea, setting it aside. Araatris: Tai steps back as the elder stands, offering Nysse a hand. “Perhaps you will get an idea once you are there.” She nods, picking the mask back up. Araatris: With a warm smile, he bows his head. “It is my hope for you as well, Nysse. And for your sister. Rest peacefully.” Tai bows to her as she leaves. Rhoelyn: The huntress continues, “And I’d really like to. I missed you, Rhoe, and I could really use your company.” The young night elf smiles fondly. Rhoelyn: Blushing, Nysse gazes happily at her sister. “Thank you, Rhoelyn. I’m here for you. Always.” She tugs Rhoe into her arms, hiding her face. Araatris: The two nightelves sit that way for a while, just appreciating each other’s wordless support as the night grows late around them.